Popcorn is a wonderful treat that almost everybody enjoys. Few people can resist the smell of freshly popped popcorn. That enticing aroma gets to nearly all movie goers as soon as they open the door to the theater. The history of popcorn is quite extensive as it has been around for many, many centuries. In Peru, ancient popcorn making vessels were found on the coast. These vessels were shallow with a hole on top. They had a long, stick-like handle on them. These poppers were also decorated with the images of felines. They date back to around 300 A.D. and are believed to be made by the Pre-Incan Mohicans. The bible has several passages that mention corn. The writer was not referencing the corn that we use today. Corn in biblical times was actually barley. Many languages used the word "corn" for whichever grain was most widely used in that region. Corn, as we know it, did not make it to those countries until much later. Most scholars studying the history of popcorn believe that popcorn originated in Central America, specifically Mexico. There, archeologists uncovered a funeral urn that is believed to date back to 300 A.D. This urn depicts Tlaloc, the Maize God wearing a headdress adorned with popcorn. Back then, popcorn wasn't just for eating. It was used as an embellishment for celebrations, made into necklaces and headdresses and used to decorate statues of gods. It has also been indicated that popcorn was grown in Sumatra, China and India before the fifteenth century. Historians aren't quite sure how it was introduced to these regions. They have located and uncovered numerous popped kernels in each of these countries that have been preserved underground for centuries. Archeologists report that Native Americans enjoyed popcorn over two thousand years ago. The Indians would pop the corn on flat rocks in the fire. As the corn popped, it would fly into the air. It was a game to catch the popcorn before it hit the ground. The history of popcorn indicates that later, the Indians began to use pottery to make popcorn. They would fill the bottom of the pot with sand and place the kernels on top. The vessel would then be placed on a rock inside of the fire. The kernels would pop and stay inside the pottery. This was much easier than having to catch it as it popped. This was one of many improvements in popping methods we have seen in the history of popcorn. The Winnebago Indians found a better and tastier way to make their popcorn. They inserted a stick into the ear of corn and would hold it over the fire. The kernels would pop and stay attached to the ear. Because there are oils inside of the ear, the popcorn had a buttery flavor making it much more delectable than popping the kernels on rocks. The history of popcorn, as recorded in the diary of Christopher Columbus, indicates that the Native Americans sold popcorn to his sailors. He also penned that young girls and women wore necklaces, corsages and headdresses made of popcorn. It may not be a fashion statement today but back then, that was the popular thing to do! I'll bet that you didn't know there was popcorn at the first Thanksgiving. The Wampanoag Indian, Chief Massasoit brought popcorn to the settler's feast. The colonists were soon enjoying this delicious treat as they were taught how to grow and pop it. The colonists began to use popcorn as a breakfast meal. They would add sugar and fresh milk for the morning meal. This was probably the first breakfast cereal ever! Later, vessels were being specifically made for popping corn. Although crude, they did the job. Blacksmiths created mesh-like baskets with long handles to make popcorn. Some of these baskets were as big as eight feet wide. They were used for celebrations and large gatherings. The history of popcorn shows that the popularity of popcorn continued to increase throughout the years. 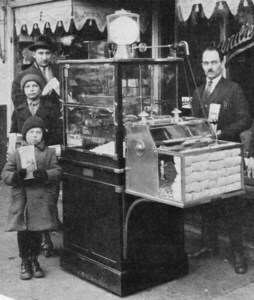 In the 1800's, popcorn carts were invented and seen almost everywhere in the cities. The corn was popped using either steam or gas. The carts would be walked through the crowds at fairs, carnivals and community events. During the Great Depression, people continued their snacking on these tasty treats. At that time, sugar was being strictly rationed so sweets were hard to find. Americans turned to popcorn for snacking and the consumption tripled during these years. Once televisions were introduced to American households, the popcorn industry declined, according to the history of popcorn. Fewer people were going to the local cinema so less people ate popcorn. Then, there was Jiffy Pop, Jolly Time and Orville Redenbacher. This brought people the ability to have their wonderful snack at home in front of the television. Popcorn is grown in many places however; the majority of corn for popping is produced in the United States. The "Corn Belt" of the U.S. is made up of Illinois, Iowa, Indiana, Kentucky, Nebraska, Ohio and Kansas. These states produce most of the popping corn for the world. Nebraska leads the states in production. Approximately two hundred thousand acres of corn in the U.S. is harvested for popping. Each acre produces 2,860 pounds of kernels for popping corn. This equates to a whopping 57,200,200 pounds of popcorn kernels grown annually in the United States! Now that?s a lot of popcorn. The average American consumes seventy quarts of popcorn every year. Nearly eighteen billion quarts of this yummy snack are eaten in the U.S. annually. That doesn't include the small farms that grow and sell popping corn locally. There are several countries that grow corn for popping but the United States is the leader in production. US growers export about 246 million pounds annually. Europeans have recently fallen in love with this tasty snack and the consumption there has been increasing. As we examine the history of popcorn we see that through the years popcorn has evolved. It can be salted, buttered, candy coated, covered in chocolate or toffee, doused with cheese or sprinkled with a variety of seasonings. Regardless of which way is your favorite, popcorn is one of the mainstay snacks in America and many other countries.